This month, Alaska celebrated its 60th anniversary of statehood. Much of the economic and population growth of Alaska as a U.S. territory and as the 49th state have been tied to air, highway, shipping ports and rail transportation improvements. The completion of the Alaska Railroad in 1923 and aviation improvements throughout the 20th century resulted in successful growth for Alaska’s economy, as well as reliable access to goods and services for citizens throughout the state. 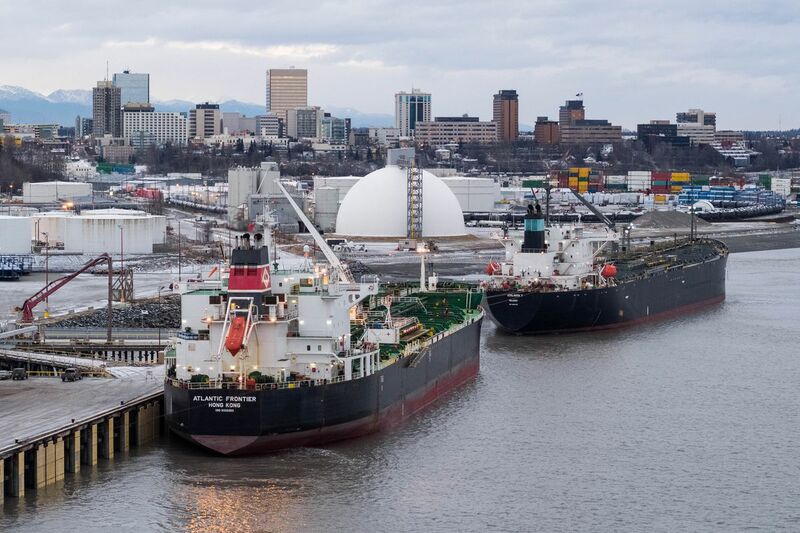 A potential bottleneck for sustaining Alaska’s future economic growth is the state’s dependency on the Port of Anchorage. More than 85 percent of the food, commercial goods, equipment and other commodities for Alaska citizens come through this single port. With an average of only three days’ supply of food on store shelves and warehouses statewide, the Nov. 30 earthquake renewed awareness of the risks to all Alaskans if the port is severely damaged in a future earthquake. At this point in the 21st century, Alaska is poised to be transformed over its next 60 years by an innovative transportation project -- the InterContinental Railway. The project would build more than 5,000 miles of new railroad to connect North America with Russia and Asia via Alaska and a 60-mile tunnel under the Bering Strait. The route of the InterContinental Railway will place Alaska in the geographic center of global commerce as more than 100 million gross tons of freight move annually through the Bering Strait Tunnel, providing faster shipping times between the United States, China and other destinations of global commerce on electrically powered, zero-emission trains. For the future of Alaska, the east-west route of the ICR will create a remarkable trans-Alaska right-of-way for the transmission of electricity, natural gas, telecommunications and fresh water. The electrified rail line and branches to the North Slope, Nome and other areas in Alaska will provide transportation and power for the responsible access and development of Alaska’s natural resources. The project will also be important to create jobs and improve the cost of living and quality of life across the state. For example, Alaska will be connected to the Lower 48 for the first time by rail. This will create incredible efficiencies and reliability in access to raw materials, equipment and components for Alaska businesses and lower the costs of shipping finished products to customers throughout the U.S. and the world. These improved supply chain economics will be a game changer for diversifying Alaska’s economy and reducing dependency on revenues from oil and gas production. The ICR rail connection to the Lower 48 will also provide Alaska with an alternate transportation supply line for food supplies, heavy equipment and rebuilding materials should the Port of Anchorage be severely damaged by a future earthquake. Although the InterContinental Railway will cost more than $100 billion to construct, private international construction consortiums are expected to maximize the use of private financing to reduce the need for direct government financing. The ICR price tag is also a bargain, because the Bering Strait rail tunnel and infrastructure assets will have a useful life of between 100 years and 200 years, creating economic growth and activity for generations to come in Alaska. During recent InterContinental Railway community meetings held in Anchorage, Nome, Wales and Diomede, Native councils and tribal elders pointed out the importance of ensuring that Native communities are part of the decision-making process for the project to ensure respect of native traditions, lands and opportunities to train and hire Alaskans. They also recognized the importance of these decisions to ensure that the InterContinental Railway improves the quality of life for generations to come in a way that is in harmony with tribal traditions and in respect for the animals, plants and lands that are important for subsistence living. The InterContinental Railway is a project that will also require developing a mutually beneficial treaty for the U.S., Canada, Russia, China and other countries to ensure international cooperation and commitment to the project. Despite recent issues in U.S.-Russia relations, the ICR is a project that will build on the current success of transportation, fishing, telecommunications and space exploration projects with Russia. It will also augment China’s status as Alaska’s biggest foreign trading partner. Alaska’s next 60 years will include important milestones such as the centennial of the Alaska Railroad, our nation’s 250th birthday and Alaska’s statehood centennial. The InterContinental Railway is a project that will transform Alaska’s future with more jobs, responsible resource development as well as reducing the cost of living and improving the quality of life for all Alaskans statewide. The ICR will also transform the future of global commerce and international relations by building a remarkable transportation asset for the peace, progress and prosperity of all nations involved. George Koumal and Joseph Henri are the co-founders of the InterContinental Railway. Scott Spencer is the Chief Project Advisor for the ICR. More information is available at www.InterContinentalRailway.com.